Zuni Tea is a uniquely natural, fragrant and flavorful tea. 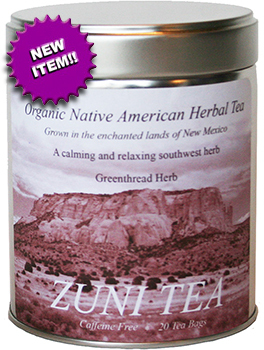 ZUNI TEA: An organic Native American herbal tea. Zuni Tea is a uniquely natural, fragrant and flavorful tea that deliveres lifestyle benefits which may include improved kidney function, headache relief, healthier blood pressure, more vibrant complexion, better digestion, and strengthened immunity. Considered a natural stress reliever and anxiety reliever by the Native Americans of the Zuni Pueblo of northwest New Mexico, Zuni Tea has been harvested by the Zunis for countless generations. Contains: Greenthread herb. 100% natural. Caffeine free! Rich in Antioxidants. 20 tea bags.